Our St Tropez dining sets offer an elegant and refined style. The sets include solid teak dining tables in a variety of styles, from extending to fixed and all our teak dining tables are made from the finest grade-A teak. 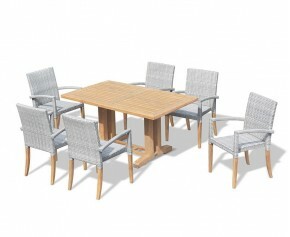 The St Tropez dining sets also feature stylish wicker chairs that have been woven out of synthetic fibre, guaranteeing the same great look and feel of genuine rattan but with the added benefits of greater durability and weather resistance. Offering an eclectic mix of teak and rattan, this table and chairs set offers the ultimate in style and quality; and is sure to be the envy of all your friends.Modestly sized to suit most garden spaces, this teak and rattan table and chairs set is comfortable, hardwearing and stylish. 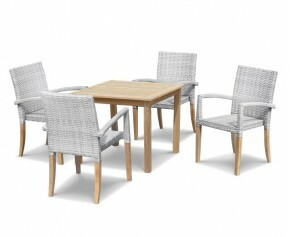 Delight family and friends with the addition of this contemporary rattan 6 seater dining set. Offering an eclectic mix of teak and rattan, this rattan 6 seater dining set is modestly sized to suit most outdoor spaces and offers plenty of options for al fresco dining and garden entertainment. 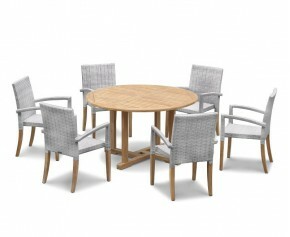 Offering an eclectic mix of teak and rattan, this extending teak table and rattan stacking chairs set offers the ultimate in garden comfort and grandeur.Expertly manufactured to the highest spec in sustainable A-grade teak and synthetic Rehau wicker, this teak table and rattan stacking chairs set is hardwearing, comfortable, stylish and easy to maintain. 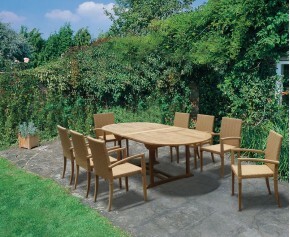 Our great value teak and rattan dining set has been built to the highest spec and is sure to impress your guests. Enjoy family meals al fresco, or invite friends over for a barbecue. 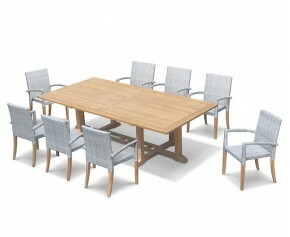 This Hilgrove 8 seater rectangular table 2.6m and St. Tropez stacking chairs set is expertly crafted from sustainable grade-A teak and all-weather rattan for long life and great looks. Our St Tropez dining sets can remain outdoors all year round with minimal maintenance required, ensuring long lasting and fruitful use for years to come. 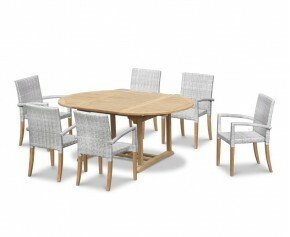 Wonderful as a stunning focal point in your outdoor space, view our range of St Tropez dining sets here.